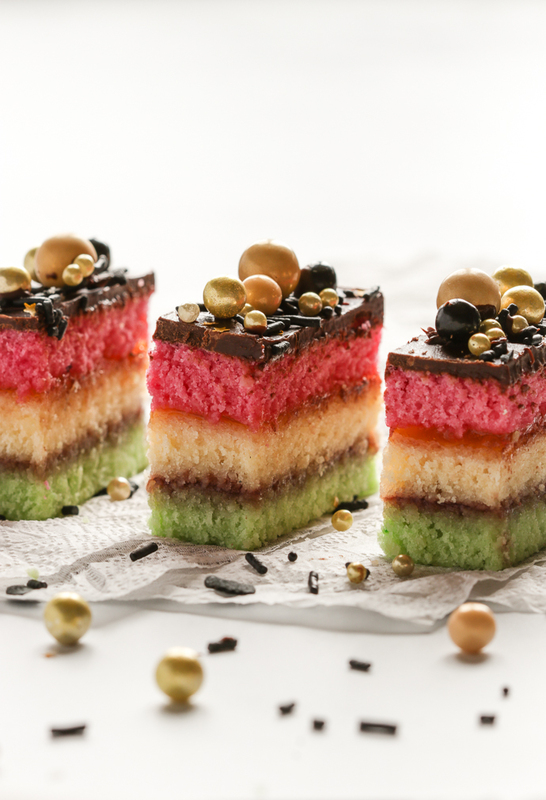 Italian Rainbow Cookies are dense almond scented cake layers with raspberry and apricot jams nestled between the sheets of sponge cakes. 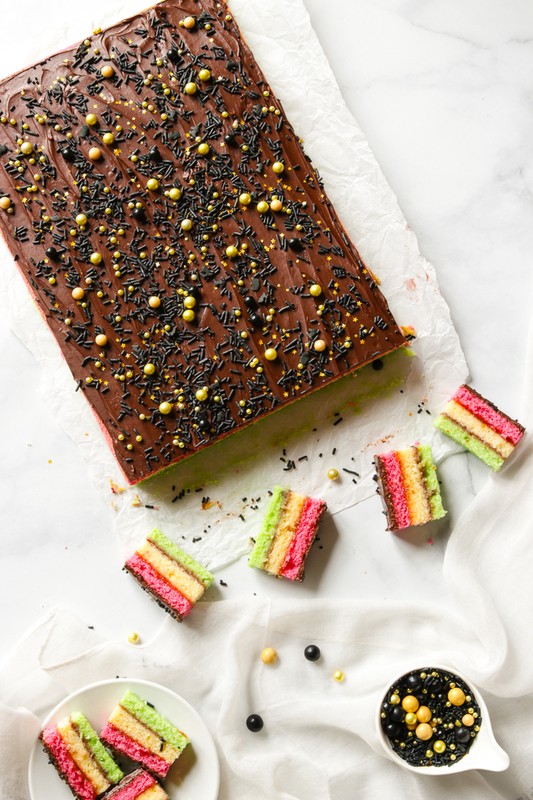 This three layer cake is then topped with melted chocolate and a generous sprinkle of festive nonpareils for a truly eye catching and special holiday treat. They’re almost too pretty to eat and totally irresistible! This post was originally published in December of 2015 and republished December 14, 2018 with updated photos and content. 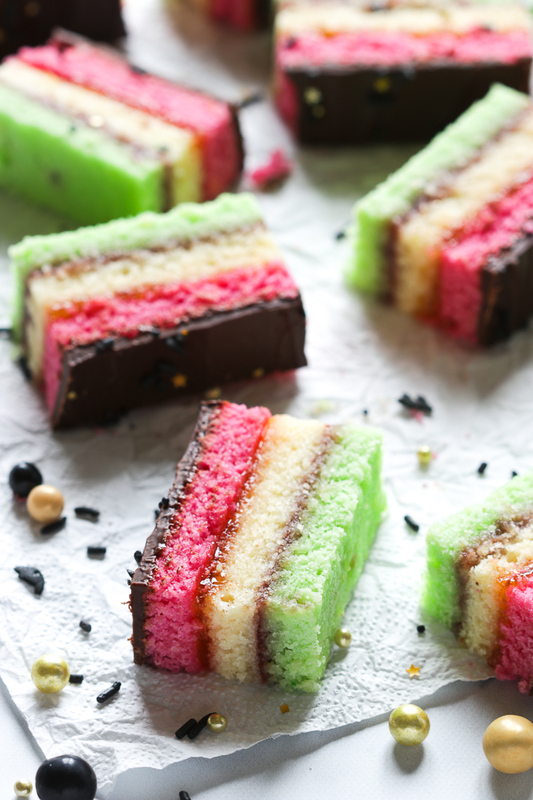 When planning my Christmas baking, these pretty Italian rainbow cookies are one of my very first to make. You can bake them up to two weeks before Christmas as this allows the flavours to mellow. 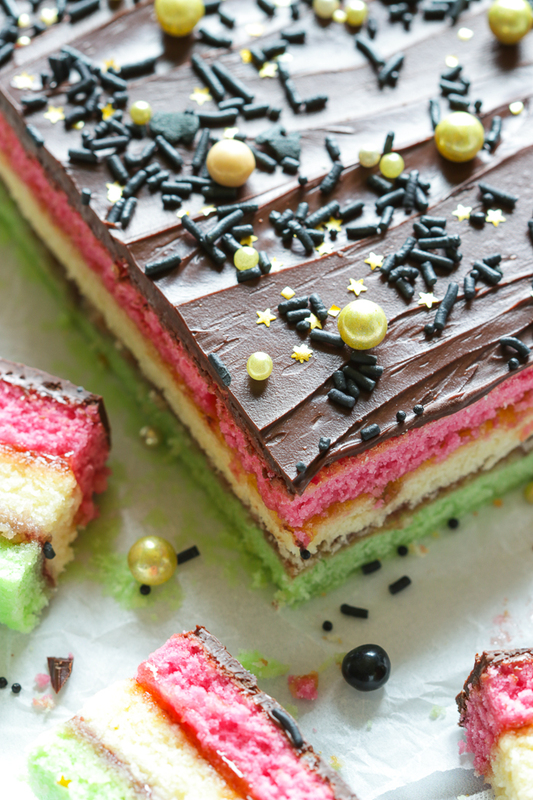 Also, both the raspberry and apricot jams layered between the sponge cakes keeps these rainbow cookies moist and packed full of yummy flavours. I love them not only for their almond scent but also for their visual appeal. They’re bright and cheerful adorned with festive sprinkles and instantly put me in my happy place! They’re little morsels of deliciousness on a platter! They’ve graced my Christmas cookie tray for many years and have always been one of the first to disappear. I had always made these cookies with store bought almond paste before but where I live a good almond paste is always hard to find. Nowadays I much prefer making my very own. You’re going to find it so so easy to make! And, I’ve simplified it from the original recipe I posted a few years back from Kristina Castella’s cookbook titled Crazy About Cookies. I’ve omitted the simple syrup as this made the paste a little too loose which had some readers skeptical. Although it had worked wonderfully, it yielded more then you would need to make these rainbow cookies. My revised version makes just enough to use in this recipe. All you need are a few simple ingredients of blanched almonds (see note below for blanching your own). Add some powdered sugar, almond extract, a food processor and your good to go! However if making your own seems somewhat daunting, by all means go for the store bought variety…whatever works for you is fine. They’re absolutely wonderful any time of the year but are extra special for Christmas and will impress your guests! Simply plate, serve and enjoy with your favourite cup of coffee or tea! A tri-coloured sponge cookie with homemade almond paste, layered with both raspberry and apricot jams and spread with melted chocolate. Place the almonds and 1/4 cup of the icing sugar in a food processor and pulse until the mixture has the appearance of coarse sand. Add in the remaining sugar and pulse until the mixture is very fine. Add the almond extract and water then pulse again until thoroughly combined. Set aside. Butter three, 13 inch by 9 inch baking pans. Line the pans with parchment paper and grease the paper. In a large bowl, cream together the almond paste, butter, sugar and egg yolks until fluffy and smooth. In a small mixing bowl, beat the egg whites (with clean beaters) until soft peaks form. Fold the beaten egg whites into the cake batter until it is thoroughly blended. Divide the cake batter equally among three small bowls. Colour one portion with the red food colouring and one with the green and leave the third portion uncoloured. Spread each portion of cake batter into the prepared pans, smoothing the top with an offset spatula. Bake in preheated oven for about 10-12 minutes, until the edges are a light golden brown. Transfer the pans on a cooling rack. Once cooled, invert the green layer onto a cookie sheet and peel off the parchment paper. Spread the raspberry jam evenly all over. Top with the uncoloured layer and spread evenly with the apricot jam. Top with the pink layer and cover with saran wrap or cling wrap. Set a cookie sheet on top to compress the layers together. Refrigerate overnight. The next day, melt the chocolate in the microwave, in 15 second intervals until melted. Spread the melted chocolate over the pink layer and top with sprinkles of your choice. Set aside and allow the chocolate to harden. Once the chocolate is set, trim off the edges with a sharp knife. When ready to serve, cut 1/2 inch strips across the width and then each strip into 4 pieces. Store in airtight container and keep refrigerated. These Lemon Cornmeal S cookies are really quite tender with a lovely gritty texture from the addition of yellow corn meal. 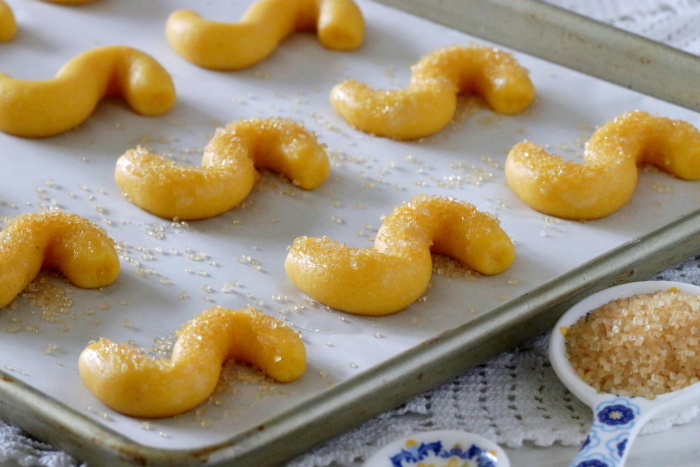 They carry an unmistakable lemon scent and are deliciously simple to make! My love for any type of cookie is well documented in previous recipe posts. So much so that I rarely ever have store bought cookies around. Unless, they’re Italian S shaped cookies which I usually buy from Italian specialty shops. Both my children have fond memories of dipping their hands into their favourite cookie jar brimming with store bought S shaped cookies. But really, I must say that we adults enjoyed them as much as they if not more! 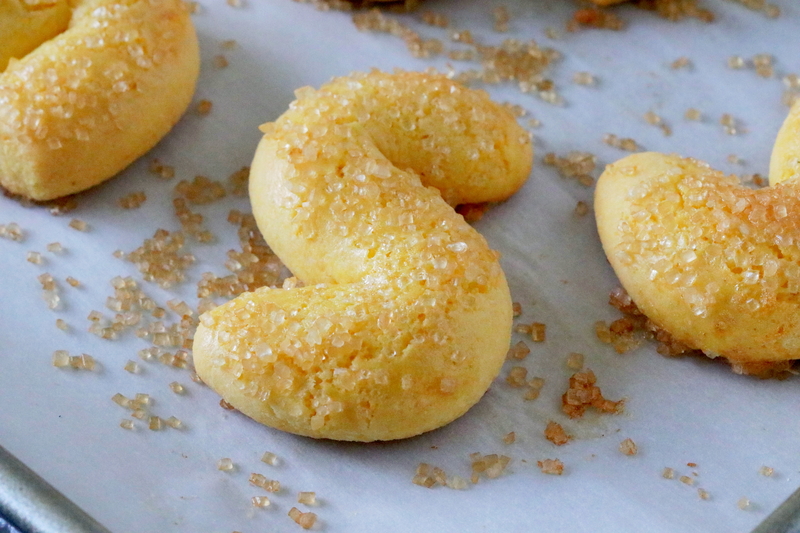 Recently, my daughter suggested I try making some homemade S cookies from scratch. This had me wondering why I hadn’t thought of it before. I knew at that moment that I needed a homemade version in my life…ASAP! I aimed for a cookie with texture and knew cornmeal would work wonderfully and lend a pleasant gritty feel. But I also wanted them to be rich in taste and so I played around with egg ratios till my family members gave them a thumbs up. 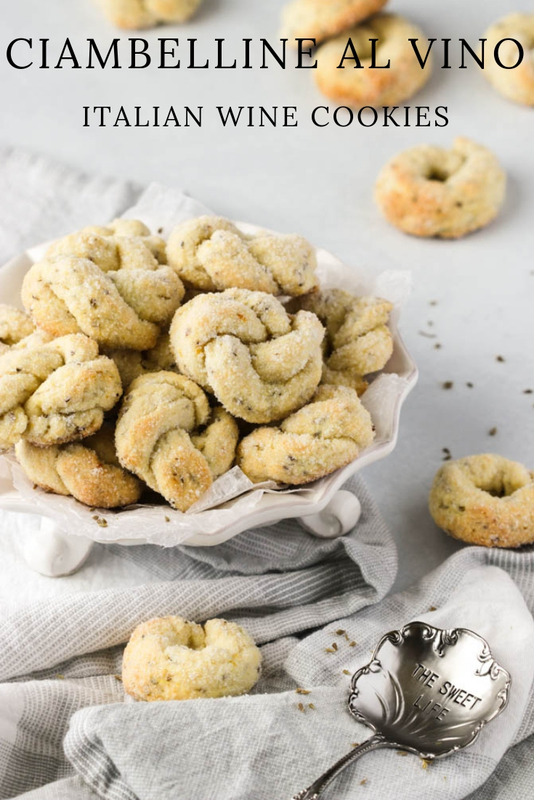 Aside from being pleasantly gritty in texture they’re also extremely airy and make a lovely alternative to a much sweeter cookie and simply beg to be dipped in a steaming cup of coffee or tea. Another area I experimented with was in baking a batch using whisked dry ingredients and another with dry sifted ingredients. I must say there was a remarkable difference in the two methods and both with wonderful results. In whisking the dry ingredients together I achieved a soft workable dough and I needed a minimal amount of flour on my hands to shape the cookies. They baked to a lovely golden color and retained their S shape. In texture they were both airy and dry but still tender, with similar characteristics of the store bought variety but much tastier in my opinion. While sifting the dry ingredients in my next batch, this yielded a notable difference. Sifting aerated the dough which necessitated in an extra 1/2 cup of flour to be workable in shaping the S cookies. The other is that the cookies spread out ever so slightly and were much softer, airier and lighter in texture. Again both equally delicious and something to keep in mind when trying the recipe for yourselves! 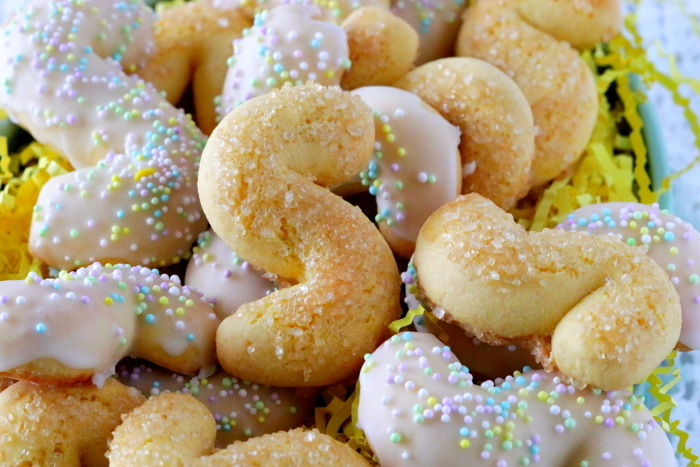 While we enjoyed both variations of these adorable Lemon Cornmeal S Cookies, I love them sprinkled with turbinado sugar. My daughter less so! A great compromise would be to bake half the batch of S cookies without the sprinkle of sugar. It’s a win win in my opinion! 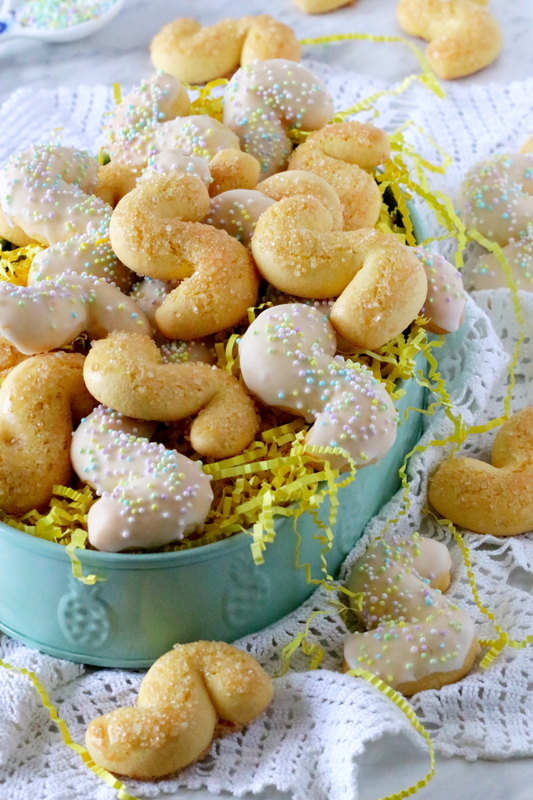 In lieu of the Easter holiday, I dipped some in a lemon glaze and topped them with sprinkles. If you plan to do the same, simply omit brushing the cookies with the egg wash and also omit the turbinado sugar. 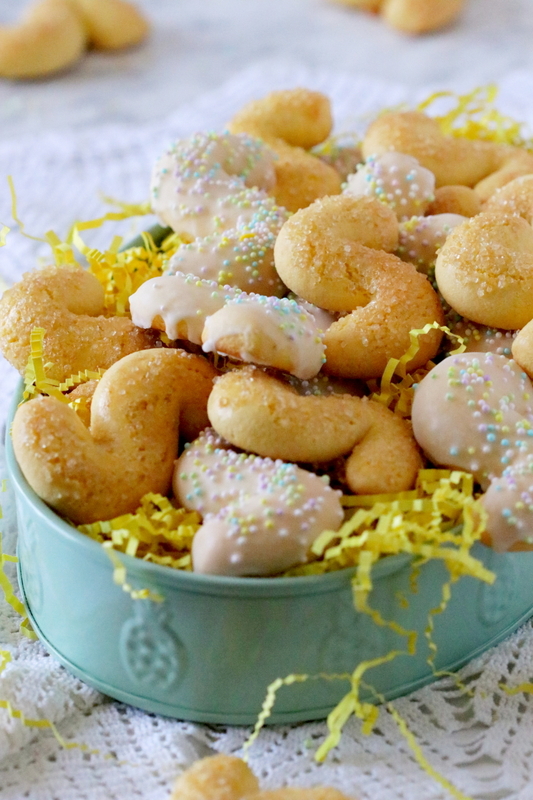 Hopefully your cookie jar is brimming with your own favorite goodies this long Easter weekend! Buona Pasqua a tutti…Happy Easter everyone! 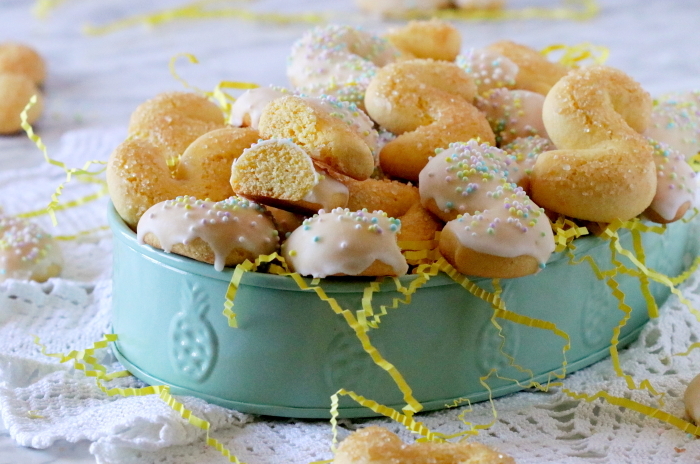 These Lemon Cornmeal S cookies are really quite tender with a lovely gritty texture from the addition of yellow corn meal and carry a subtle lemon scent, enough to perk up your taste buds. Line 3 baking sheets with parchment paper and set aside while you prepare the cookie dough. In a large bowl whisk together the flour, cornmeal, baking powder and salt then set aside. Place the sugar and lemon zest in a food processor and pulse together for about 20 seconds to make a quick lemon sugar, then set aside. In the bowl of a stand mixer or hand held mixer, beat together the 2 whole eggs, 4 egg yolks, and lemon sugar on medium high speed for 5 minutes till thickened. Mix in the melted butter, lemon juice and vanilla extract until combined. Stir in the flour mixture until thoroughly combined. The dough will be soft but manageable to work with. Preheat the oven to 350 degrees F while you start rolling and shaping the S cookies. Scoop out a large ball of cookie dough using an ice-cream scoop. Dust hands with a bit of flour and roll out to form a 12 inch long rope about a 1/2 inch in diameter. Cut the rope into 3 equal pieces of 4 inches each. Transfer each piece one at a time to the prepared cookie sheet and bend into an S shape while spacing the cookies about 2 inches apart. Beat the reserved egg whites and brush lightly over the S shaped cookies. Sprinkle the cookies with the turbinado sugar and bake for about 13 to 15 minutes. When done the cookies should have a lovely golden color. Allow to cool and enjoy with a cup of coffee or tea. 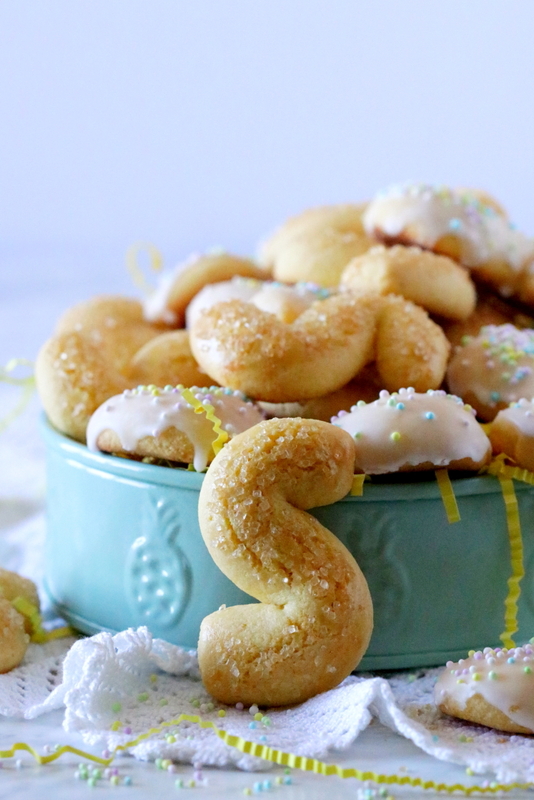 If planning to dip some of the cookies in a lemon glaze, OMIT brushing the S cookies with beaten egg whites and the turbinado sugar, then bake as directed. Once cooled dip them in a lemon glaze to a ratio of 1 cup powdered sugar to 2 tablespoons lemon juice, approximately, depending on how thick you want the lemon glaze. Top with sprinkles of your choice before icing sets. 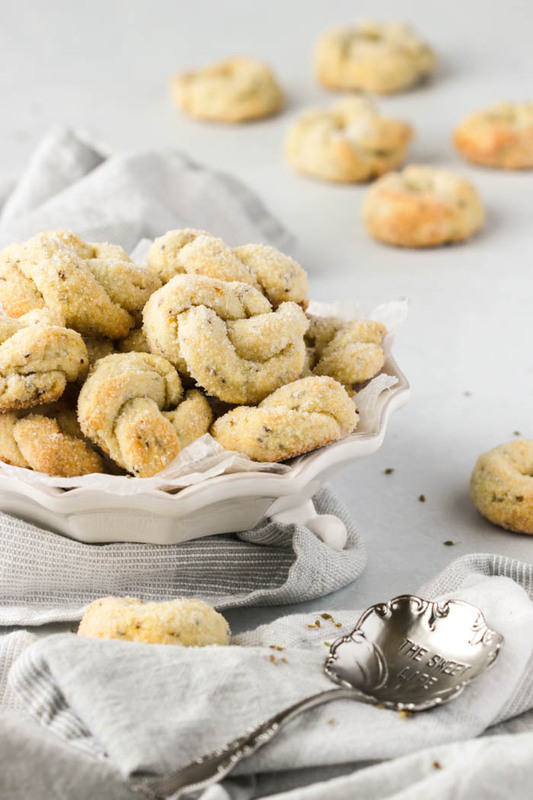 These Italian Bocconotti Cookies are seductive little morsels with their scalloped buttery shells and a lovely fig jam cocooned within. 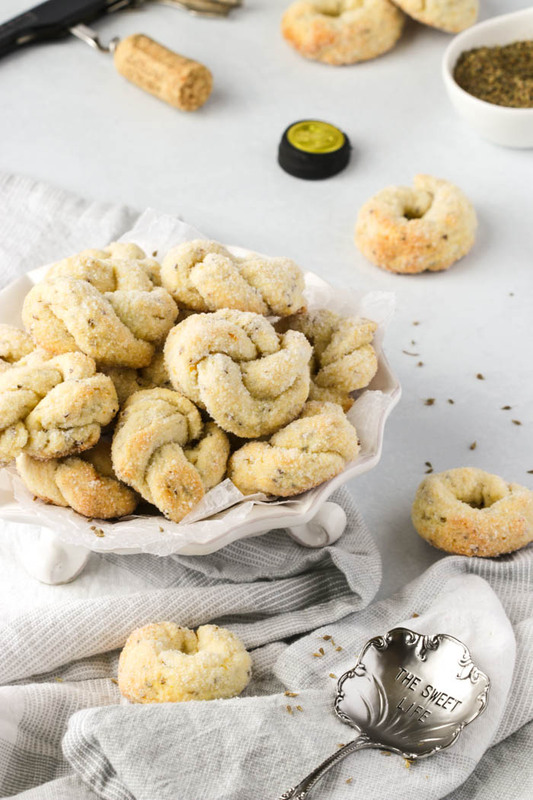 All that’s needed is a light dusting of powdered sugar before serving and then simply relax in your comfy chair with a hot cup of tea while nibbling on these dainty treats. 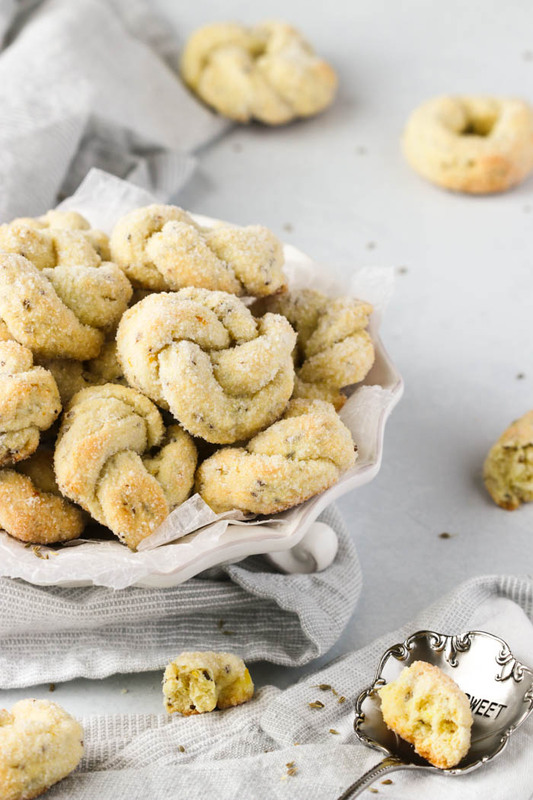 There are so many variations of these cute bocconotti cookies, which easily translates to “small bites” and aptly named I might add for these two bite morsels. They’re more commonly served during Christmas with a chocolate and nut filling, much like the bocconotti abruzzesi or even the bocconotti calabresi from southern Italy. However in my opinion when a cookie is as seductive in appearance and taste as these jam filled pastries, well any day of the year is a good day to bake them! As I’m sure you’ll all agree when you try them out for yourselves! One question that I get asked often when posting a new recipe is, “but is it easy to make”? My answer is always “yes”! And yes I see some eyes rolling right now so roll them back! If you’ve never worked with a pastry dough before, you’ll be happy to know that your food processor will be doing most of the work here. Then there’s a gentle kneading of the dough by hand so that it all comes together in a cohesive ball. 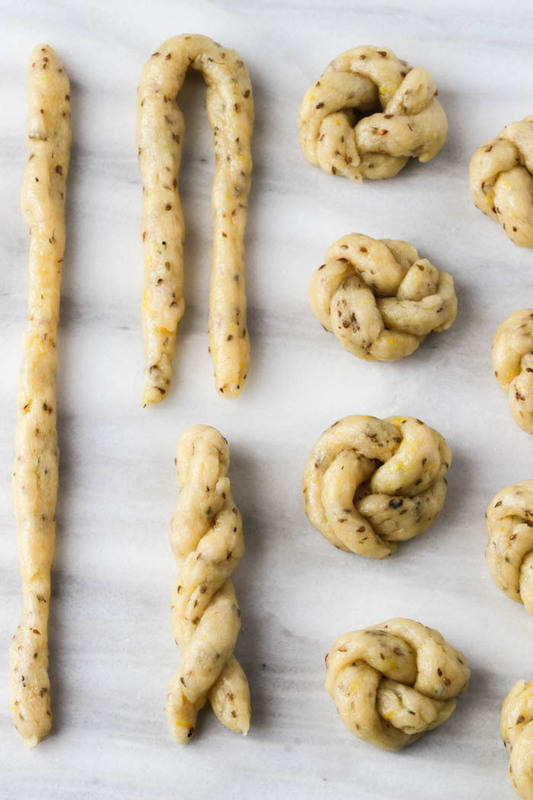 Once the dough has been chilled and your ready to assemble the bocconotti cookies…the fun begins! Set an hour of your time to shape out and assemble the bocconotti. Although I used a fig jam you can just as easily replace it with any flavor you prefer and even Nutella would be a wonderful choice! Once all assembled and ready for the oven, in they go for about 18 to 20 minutes or until a beautiful golden brown! You’ll have the most enticing aromas wafting thorough your kitchen and beckoning family members in. Then a simple light…or generous dusting of powdered sugar to finish them off and enjoy! 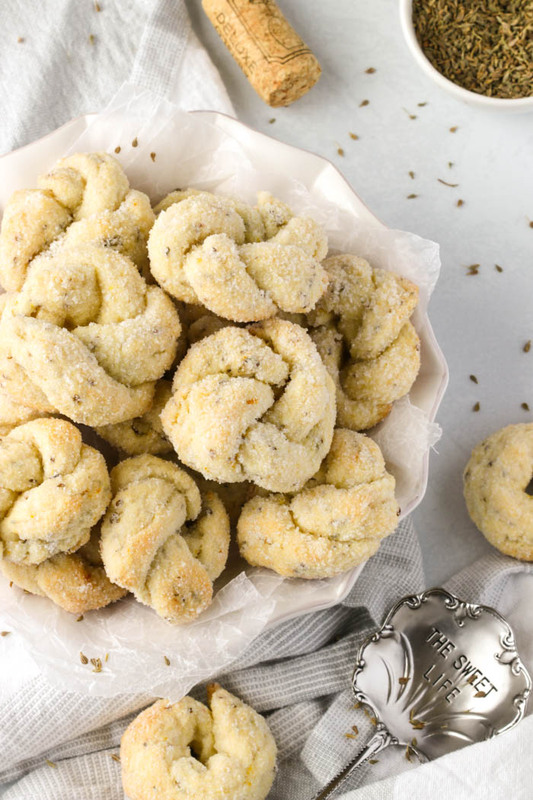 Show your family or friends some love this weekend with these easy to make Italian Bocconotti Cookies! 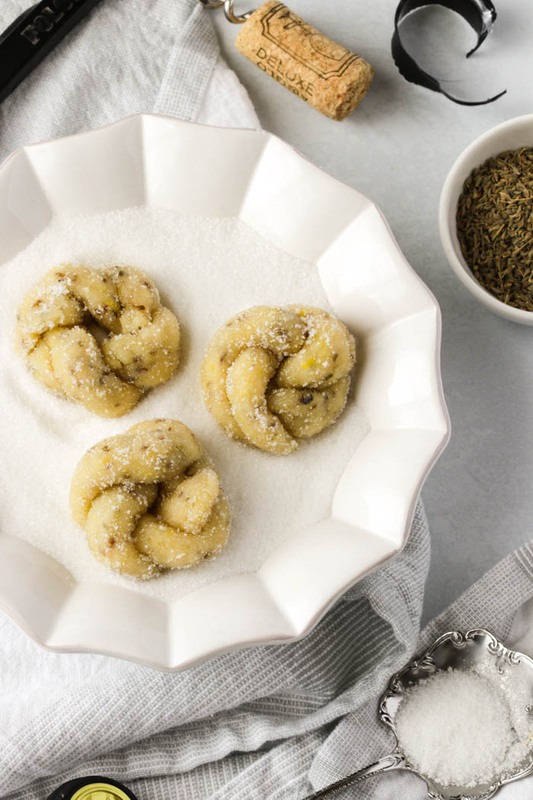 These Italian Bocconotti Cookies are seductive little morsels with their scalloped buttery shells and a lovely fig jam cocooned within. Icing sugar powdered sugar for dusting. Place the flour, sugar, baking powder and salt together in a food processor and pulse for a few seconds to combine the ingredients. Add the chilled cubed butter and pulse the mixture together, just until you achieve coarse crumbs. Whisk together the egg with the grated orange zest in a small bowl and add this egg mixture to the food processor. Blend in the food processor until half of the dough mixture has come together then transfer to a work surface and keep kneading gently by hand until the dough has formed a ball. Wrap the pastry dough in cling wrap and chill for 1 hour. When ready to assemble the pastries, grease well 24 mini tart molds or use mini muffin pans. Break off a tablespoon of dough and form into a ball then take the ball of dough and press it into the mini tart mold and up against the edges. Repeat with the remaining molds. Fill each tartlet with about a teaspoon of jam. Take another tablespoon of dough, form into a ball and with the palm of your hands press it between two sheets of cling wrap. Place the flattened disks over the jam filled tartlets and press the dough around the edges of the mini molds to seal and then cut off any excess dough. The excess dough can be reused to form more tops if needed. Place the mini tartlets on a baking sheet and bake in a preheated oven at 350 degrees F for about 18 to 20 minutes or until a lovely golden brown. Allow the bocconotti to cool before dusting with icing sugar. Brew a cup of coffee or tea and enjoy!